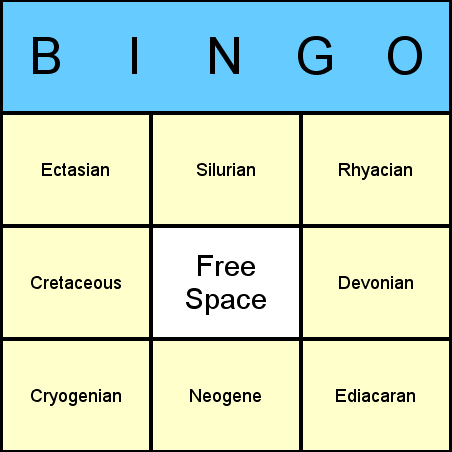 Geological Periods Bingo is a fun way to learn about the various geological periods in Earth's past - this variant using the North American period names (the period known internationally as "Carboniferous" is subdivided into the "Mississippian" and "Pennsylvanian"). You play just like a normal bingo game, except the items and cards all have a geological periods theme. If you'd like to create your own geological bingo cards but with your own customized list of items, you can do so easily, by using the Bingo Card Printer software. The software (after you have Registered to get the full version) allows you to add your own items or delete any items that you don't want. Below is a printable set of geological periods bingo cards (click the Print icon in the window to print) along with a call-list. Just print and play! Instructions for producing your own custom geological periods bingo cards are below.